U.S. Naval Air Station loaned to the Admiralty form August 1943. 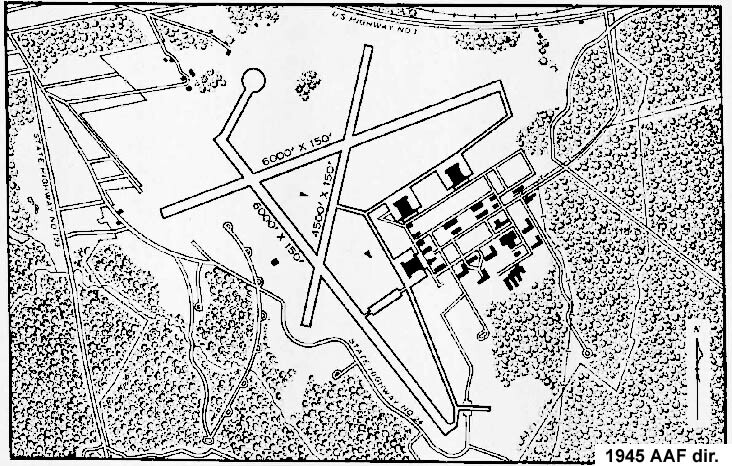 The airfield lies located 2 miles NE of Brunswick, Maine. --/-- QDM. ---° ----° .... --- x -- yds. Formed here 23.11.43. Disbanded 01.07.44. Moved here from USNAS Lewiston 14.02.45. Disbanded here 31.07.45. Equipped with Avenger, Corsair, Wildcat, Harvard and Grumman Gosse. Disembarked from H.M.S. SEARCHER 10.01.44. Moved to USNAS Norfolk 04.02.44. Moved here from USNAS Quonset Point 10.01.43 ?? for DLT training in USS CHARGER, returned to USNAS Quonset Point the same day. Disembarked from H.M.S. SEARCHER 10.01.44. Re-embarked 08.02.44. Equipped with Wildcat IV (Mk.V by 1944). Equipped with 9 x Helldiver. Equipped with 10 x Corsair. Moved here from USNAS Quonset Point 23.08.43. Moved to USNAS Norfolk 04.10.43. Moved here from USNAS Quonset Point 25.08.43. Moved to USNAS Floyd Bennett Filed 14.10.43. Moved here from USNAS Quonset Point 27.08.43. Moved to USNAS Norfolk 04.10.43 for DLT in USS CHARGER. Returned Brunswick 17.10.43. Moved to USNAS Floyd Bennett Filed 30.10.43. Moved here from USNAS Quonset Point 30.08.43. Disbanded here 23.11.43 to form the basis for 732 OTU. Moved here from USNAS Quonset Point 01.09.43. Moved to USNAS Norfolk (in transit to H.M.S. ATHELING) 18.12.43. Equipped with 10 (later increased to 18) x Corsair. Moved here from USNAS Quonset Point 01.10.43. Moved to USNAS Norfolk 08.01.44. Equipped with 10 (later increased to 14) x Corsair. Formed here 01.03.44. Moved to USNAS Norfolk (in transit to H.M.S. SMITER) 02.06.44. Equipped with 18 x Corsair. Formed here 01.04.44. Moved to USNAS Norfolk (in transit to H.M.S. RAJAH) 27.06.44. Formed here 01.05.44. Embarked in H.M.S. TROUNCER 02.08.44. Formed here 01.06.44. Embarked in H.M.S. PUNCHER 30.08.44. Formed here 01.07.44. Moved to USNAS Norfolk (in transit to H.M.S. RANEE) 15.10.44. Formed here 01.08.44. Moved to USNAS Floyd Bennett Field 15.11.44. Formed here 01.09.44. Moved to USNAS Floyd Bennett Field 23.12.44. Formed here 01.02.45. Moved to USNAS Norfolk (in transit to H.M.S. PATROLLER) 30.03.45. Formed here 01.03.45. Moved to USNAS Floyd Bennett Field 13.07.45. Commissioned into UIS Naval Service on April 15, 1943, UIS Naval Air Station Brunswick was primarily used as a base for the formation and training of training of British and Commonwealth aircrew for Fleet Air Arm squadrons equipped with Lend-Lease American aircraft. Five auxiliary landing fields were used in support of this facility, at Bar Harbour, Casco Bay, Lewiston, Rockland, and Sanford. The air stations secondary mission was that of Anti-submarine warfare conducted by the USN; the first U. S. squadron to arrive was a heavier than air Scouting Squadron (VS1D1), under the command of Lieutenant John G. Shelley, at the time of their arrival the station was still under construction. 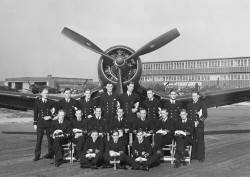 The first Royal Navy squadron to arrive was 846 with Avengers, they moved here from USNAS Norfolk June 1st 1943, moving on to USNAS Quonset Point on the 31st. Two weeks later a second Avenger squadron arrived, 848 moved here from USNAS Quonset Point on July 15th., they stayed for only two weeks before they moved to USNAS Squantum on the 31st. From August 1943 the station began receiving Corsair squadrons for working up; the squadrons had been formed at USNAS Quonset Point and initially received 10 aircraft per squadron. The first to arrive was 1831 NAS on August 23rd, followed by 1833 on the 25th, 1834 on the 27th and 1835 on the 30th. After only six weeks of training the 1831 & 1834 squadrons moved to USNAS Norfolk on October 4th, 1833 departed for USNAS Floyd Bennett Field ten days later. 1835 squadron was retained at Brunswick, it had been decided to form a second-line Operational Training Unit (OTU) at Brunswick and 1835 was disbanded on November 23rd to form the nucleus of No. 732 Corsair OTU which was formed on that date. The next squadron, 1836, arrived from Quonset Point on September 1st and was followed by two more, 1837 & 1939 on October 1st. 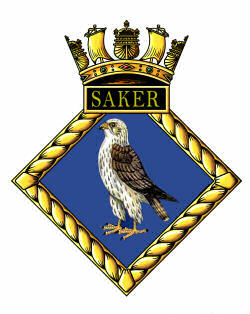 The training time was increased for this second wave of squadrons, 1836 departed for USNAS Norfolk (to embark in H.M.S. ATHELING for passage to the UK) on December 18th. 1837 & 1838 departed for USNAS Norfolk on January 8th 1944. The next squadrons to arrive on the station were 882 and 898 Wildcat Squadrons which flew ashore from H.M.S. SEARCHER on January 10th; 882 stayed until February 4th before moving to USNAS Norfolk. 898 re-embarked in SEARCHER on February 8th. There was a two month gap before the next Corsair squadrons arrived, and these were larger units, equipped with 18 aircraft. 1041 & 1842 moved here from USNAS Quonset Point on March 1st 1944; these were the last new squadrons to be formed at Quonset Point, form May 1944 all new Corsair squadrons formed at Brunswick with 18 aircraft. On April 1st a new Dive Bomber squadron was formed, No. 1820 squadron formed with 9 Curtis SBC-4 Helldivers; the squadron moved to USNAS Squantum on May 1st. On the same day 1843 formed with 18 Corsairs. It was a month later that the next squadron was formed. 1845 came into being on June 1st. The following day 1841 moved to USNAS Norfolk (to embark in H.M.S. SMITER);1842 moved to USNAS Norfolk (to embark in H.M.S. RAJAH) on the 27th. The start of July saw two squadrons form and one disband at Brunswick, 1846 1848 each formed with 18 x Corsairs, While 732 OTU having completed its work was dispersed. August 1st saw two more Corsair squadrons form, 1849 & 1850; 1843 embarked in H.M.S. TROUNCER on the 2nd and 1845 embarked in H.M.S. PUNCHER 3on the 3oth. The last squadron to form during 1944 was 1851 on September 1st; there was a five month gap before the next new squadrons would form. 1846 & 1848 both departed to USNAS Norfolk (to embark in H.M.S. 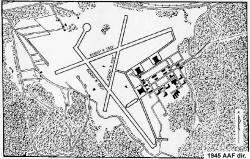 RANEE) on October 15th, 1849 & 1850 moved to USNAS Floyd Bennett Field one month later, followed by 1851 on December 23rd. This left no squadrons on the station by Christmas 1944. In the New Year only two more Corsair squadrons were to form, 1852 on February 1st and 1853 on March 1st, again, both receiving 18 aircraft. On February 14th 1945 738 Pilot Training Squadron relocated here from USNAS Lewiston bringing with it a selection of the US aircraft types in use by the RN, including Avenger, Corsair, Wildcat, Harvard and at least 1 Grumman Gosse. At the end of March 1852 moved to USNAS Norfolk (to embark in H.M.S. PATROLLER), while the last Corsair squadron, 1853, left for USNAS Floyd Bennett Field on July 13th. The RN presence at Brunswick had begun to run down during July 1945 and on the 31st both 738 squadron and R.N. Air Station Brunswick were paid Off. and the station returned to US Navy control. "Patrol Squadron Shore Establishments". United States Navy. Acrobat document. Retrieved 14-07-2014. The personnel of 1845 Naval Air Squadron at USNAS Brunswick, June 1944. 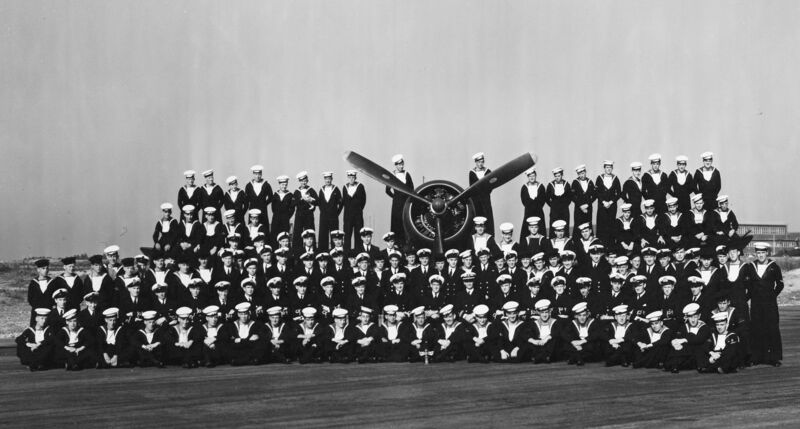 The personnel of 1849 Naval Air Squadron at USNAS Brunswick, August 1944. The 18 pilots of 1849 Naval Air Squadron at USNAS Brunswick, August 1944. Question: * Enter the last letter of the word satellite.